The Joyful Hermit | Learn to live each day simply and joyfully. Benefit from practical tips and creative ideas with The Joyful Hermit. I’ve not written on this blog in over four years. Much has transpired, and my writing has instead gone to more a chronicle of events, feelings, thoughts, and trials. I had returned to a blog titled A Catholic Hermit. Blogger.com, etc. I admit it is rather raw–an outpouring of this and that of my exile in a “desert”, of sorts, and with whatever authentic that goes on within a person, personally, even if overly-sensitive, or with details of relationships and daily life struggles. Some of it might be helpful to others, but perhaps not. For me, it has been cathartic and real. And yes, it is so raw as to include my foibles and vices–and hopefully, though, an expression of love of Christ and trust in Him no matter life’s pitfalls. We keep a goin’ (as my late Aunt Charlotte often said). In this new location (now nearly four years), I do not have the comforts I had before. The Lord seemed to think that my previous home was just too cozy for a hermit. My gardens are all gone–dug up and sold for next to nothing and also most of the perennials given away at the end of the attempt to recover the financial losses. Even the stone pathways were dug up and hauled off by a most happy man who got a steal on them. I do not have my camera set up to take photos, and even took a bit of figuring as to how to get onto this site to write even this much. Followers have dropped away. I plan to maintain this site for there is hope that with the Lord Jesus’ help, and the prayers of many, I will be able to get this current hermitage into livable condition. I am about out of funds–frighteningly little left–but I continue to work on the place as best I can. Regardless, if you go to catholichermit.blogspot.com (I think that is how to get to it, or Google: A Catholic Hermit), you can decide if you want to read any of what is probably too much of going on about the struggles and not enough of what might inspire and help with life in Christ. But maybe you’d find something of interest in it–even if to praise God that you have not gotten yourself into the messes this questionable-at-times “joyful” hermit does! Deciduous, blooming trees in the gardens are always a joy to behold, especially if planted so as to bloom in succession throughout spring and summer. Below are three trees I hope to sell; they are too large for me to take with me. One has to be ingenious and open to ideas from others. Thus far, I have made contact with a university extension Master Gardener group whose newsletter will mention the over 90 unusual and specimen trees for sale here. Someone else suggested the botanical gardens, and they now are letting their volunteers and staff know of the tree-trove here. That contact led to the park superintendent; he wants to develop a specimen tree area this summer in one of the city’s many parks. I also have two places that will accept my donation of trees that do not sell and will send men to dig them. I never dreamed a person could become so attached to nature, beauty, truth and goodness in trees. But I have become attached; and now the process of detaching is yet another good effort in the phases of life. What it seems God has loved of these gardens are the efforts, costs, employment of others, and sacrifice, plus the prayers in the hours and toil. Thus, I will try to please God as much in the effort to sell, dig, and transport some to create a smaller garden in the new location…and all the prayers involved in the time and work, all over again. A huge aspect of such ora et labora (prayer and work) includes those dear people who will interact with me and generously help in the process. 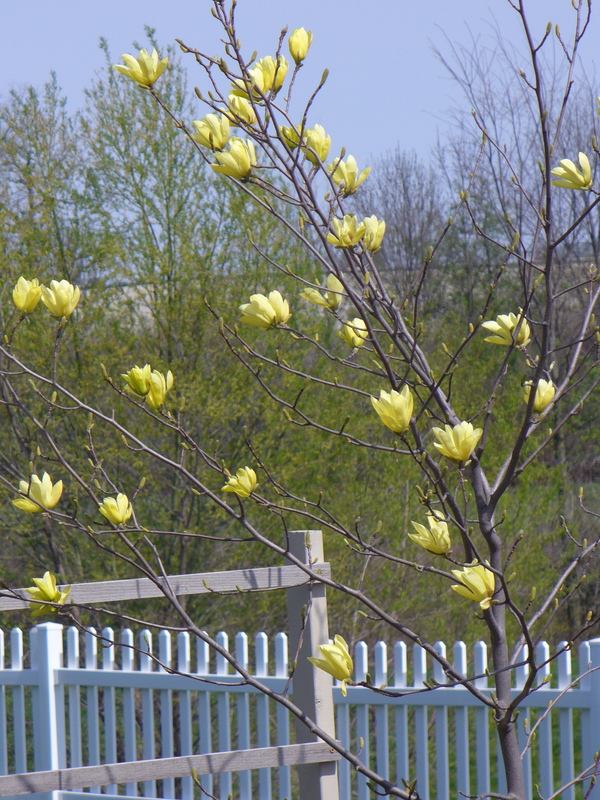 Butterfly Magnolia just beginning to bloom, 15 gal. approx. Royal Burgundy Cherry 15 gal., approx. To view, click on the “page” on the right side of this site in order to access the Catholic and Religious Art Prints, most antique of over 100 years. You may order either framed or unframed. My deepest hermit apologies for the names and numbers not lining up with photos of the art available! But please email me your wishes at joyfulhermit@gmail.com, and we can sort it out if you cannot determine what name and number goes with each print. They are in order, but my true hermit (not business tech person) limitations are humbling showing in this endeavor! After having the idea of a type of inspirational lending library, and realizing after several years that this is not God’s idea but mine, the actuality remains that in our time, people are more specific about their reading desires and needs, and the ways in which they procure books. So now, I am offering the books and media items, and eventually many antique prints and possibly some statues and relics and medals, as a means of sharing what I’ve already read or benefited by, so that strangers or friends out there can make a very small donation if they’d like to invest in items that I paid far more for, yet have enjoyed and cherished beyond their tangible worth. These books and items inspired, informed and guided me. I have many more to list over time, but I am focusing on reading what remains, and then getting it out to others who may desire and benefit very much, as well. I have these listed on the “page” on the right side of this site, relative to Books and Media for sale. Just email if you want one or more, to check for availability, and then make the suggested donation. Enjoy! I cannot extol enough the benefits of Green Glory. Yes, it used to be called Green Glop in previous post; but people complained that it did not sound appetizing. Can a rose by any other name smell as sweet? Green Glory is still very green and very gloppy, but after drinking it each morning for a year, I can attest to its merits. Someone also suggested it was too much hassle and time consuming to make. I clocked three batches concocted, blended and in convenient freezer containers enough for 20 breakfast servings: less than an hour. That came out to about 3 min. per breakfast prep. The cost is rather minimal with sale items–about 30¢ or so per abundant glassful. If you have little helpers, it can go even faster. Just purchase (or grow) the veggies and fruit, selecting what is on sale if you want bargain in addition to bodily boost. I use dark greens of all types and include a whole cucumber and two stems of celery per blender full, as these will provide organ and skin cleanse/tone. Blend according to how much can fit in the blender, removing some to freezer containers in order to add more fruit and eventually more water if desired. Repeat to make 3 batches or more at a time for expediency. Thaw overnight; drink first-thing in the morning. Between the greens, cucumbers, celery, fruits and proteins (hemp seed high in protein), the body gets a fast-start metabolic boost due to the speed of absorbing the liquid blend. This combination is touted to help with energy, skin, hair, colon and overall cleansing and refreshing. It sure has helped me, considering the chronic pain and ravishes of aging…! Then eat whatever more substantial after this drink or after dressing–oatmeal, egg, rye toast or whatever other you consume that takes you healthily well into the day. Start your family on Green Glory early in their lives, if you can convince them. I confess that my grandchildren enjoyed watching me make it (despite the blender noise), and one was game to pose as if he loves drinking it, but they each declined so much as a sip. I suppose it is only for the die-hards who have detached from texture, color and taste or are desperate to try anything that helps one feel better. Green Glory is now my morning delight, and I find the taste and texture intriguing, if not refreshing! I have been laid up with a neck injury, and prior to that was busy making some Valentine pillow cases for little ones. Note: A little boy much prefers sharks to Snoopy Heart fabric! Plus, I was practicing the harp a little, reading spiritual books, praying lots, and making another batch of Joyful Hermit Mystical Mist. Then there was the little supper with Fr. Vincent of Nigeria enjoying some soup and desserts. That meant experimenting with making Mystic Balls! I used the Mystical Mist in a variation of the Love of God Bourbon Balls; they ended up being Fr. Vincent’s favorite out of a goodly spread of pre-Lenten sweets! For a week or so prior to the neck injury, I experimented with videos. These helped with inner stripping of self-perceptions. We usually never see ourselves as we are, on the outside, other than the brief and groggy early morning moments spent before the mirror trying to get our faces converted into something more pleasing to the sense of sight. So to see oneself speaking–how the mouth pronounces words, the eye movements when thinking and talking, as well as the stark reality of age and other such–well, it is humbling. The outer should not the inner make, although it can fight to try. The inner ought form and rule the outer, for the inner will be who we are eternally. I shared more personally of thoughts. Opening up can be a good experiment. It helps to view and hear one’s thoughts being shared so as to have empathy and reality of what others are put through, seeing and listening, and how the thoughts may be interpreted clearly or not: always room to improve! Some of what I share includes discernment of hermit life in the religious aspect. This hermit (maybe not quite so joyful with the neck pain and accompanying costs) is very pleased, if not joyful, to remain a rather uncommon hermit and not being drawn off into what is called a “canonically approved” hermit. Hermits, like anyone, need no official approval, not really, from anyone. God smiling upon us and a wise spiritual mentor or guide have proven adequate for centuries of hermits. It will suffice for this one. Anyway, this is partly why I have not written much recently. This week I could barely write at all, as the letters to words keep getting jumbled in a brain that could not add or subtract and felt totally disoriented. It is amazing how neck injuries can really twist and crunch, affecting the head above it and the body below! But how wonderful that, mostly, necks heal over time in fortunate cases. The neck is like the Covenant with God. It provides the bond with and requisite, nourishing linkage of Christ the Head with the Body of Christ. Being oneself is always a challenge, for most of us may not really know ourselves well enough to be that which God has created! For one reality always remains: Our selves are constantly evolving. Yes, God works with us throughout our lives– especially if we desire so, and especially when we yield to the interplays of varying life relationships and situations sent our individual ways. But there are innate aspects to our being and personhood of which we are given–those aspects that are chosen for us and create who we are before some of the outer infringements of culture and society begin to tempt us to explore and adopt that which may not be who we are or were meant to be in God’s will. How do we know who we are, intended by God? God progresses us much as a plant begun by seed deep within the folds of soil. We grow up in a location and are affected by the variables of nature: other plants, people, birds, animals, and soil condition; and of weathering relations and experiences in all life’s storms, doldrums, dark and light. There is an innate, divinely distinctive self deep within each of us who God fashions and illumines, as we grow in this great progression of breathing and being. How do we know we are being ourselves in God’s will? (Certainly the inner becomes muddied often enough.) I am learning to note when there is peace and serenity within…. My mind is not distracted nor the body focusing on pain when what I am thinking, speaking and doing seem to flow in deep and joyous rivers toward some expansive sea. Then at other times (for me when thinking somehow I should be or do more what the temporal may incite or tempt) I become frustrated, irritable, and speak with strain, upset, or harshness. Then the physical pain dominates; the feelings of inadequacy disrupt the inner and outer quietude; the deep and joyous rivers freeze with no seeming outlet. God provides the deep and joyous rivers. He also allows the frozen frustrations to guide us and remind us as to who, what, where, when and why we be and are and do. The virtues glow when we are as we are to be; the vices riot when we are not as we ought. While what we learn and re-learn of ourselves may not be what we might choose in varying seasons of life, we discover this truth: peace and serenity are beacons in any given time or clime, for knowing we have found ourselves. And we learn to love that which God has chosen for us, and to create and develop with Him, the wholly holy persons we are intended to be. The outer does not the inner make. But inner and outer, in tandem with our Creator, enhance the self as to beautify our lives and the lives of others. The world becomes a lovely realm of humility in acceptance. There’s no way around the truth of it: Soup is good for the body, mind, heart and spirit…anytime, especially on a snowy day. The amount of vitamins, minerals and protein simmering within a bowl of soup is as astounding as the inexpense of what can be a complete meal. It is easy to make, involving no other skills than shopping, slicing, sautéing, simmering, serving and slurping. For this healthy, savory, cabbage-legume soup, begin by rinsing and straining the black-eyed peas, and then follow other package directions. (Soak overnight or parboil 5 minutes and let stand an hour prior to further simmering with soup until beans are edible). Once the beans are readied, we gather this substantive soup’s vegetables: Bok Choy, kale, red pepper, and onion. Let’s try fenugreek and fennel seeds (which, incidentally, benefit lactating mothers). While you may use the ground form of these herbal seeds, I crush them with a mortar and pestle, and then sauté lightly in a non-oiled, small skillet. Other seasonings include white pepper, sea salt, cumin, and at least three garlic cloves. Don’t forget: try some of Joyful Hermit’s Culinary Herbals™ with your soup! I purchased on clearance a jar of grilled red peppers packed in olive oil and placed them in a large pot, as the base upon which to build this soup. Otherwise, use olive oil to sauté the sliced garlic, onion, and red pepper. (Red peppers contain larger amounts of the prized lycopene than what is found in green peppers; and red gives dynamic color contrast.) Add other seasonings–except the salt, pepper and Joyful Hermit Culinary Herbals™–in this initial step. Then slice the head of Bok Choy (Chinese cabbage) and gently sauté before adding a quart of chicken broth. I use whatever broth is on sale; but if it is Thai Chicken broth, omit the curry and cumin. You may also wish to substitute vegetable broth. Next add the pre-cooked black-eyed peas, and adjust the liquid by pouring in 3-4 cups water. This may be done gradually as the beans will swell as they cook. Allowing the beans to simmer with the seasonings, broth, and Bok Choy, the flavors blend. As well, this provides the required time for releasing the benefits of the red peppers and cabbage. When the beans are softly edible, add the chopped kale and allow to steam until barely tender, along with 1-2 tsp., crushed, culinary herbals. Before serving add salt and pepper to taste, and garnish with crumbled feta cheese. Enjoy! And don’t be at all sorry you made and ate this frugal-yet-hearty soup! Note: Why call this soup Dorotheos of Gaza (I’m Sorry) Soup? For more information on Dorotheos of Gaza, go to the post featuring this hermit. As to his sage advice on how to respond when rightly or wrongly accused, here’s a reminder. Rightly accused, say, “I did it, I am sorry, please pray for me. Wrongly accused, say, “I am sorry, please pray for me.” Thus, the reason for the (sorry) title of this soup! This morning I was reminded of a man named Dorotheos of Gaza. It had to do with contrition… saying we are sorry. But first let’s learn about this hermit born into the world at Antioch in Syria around 506. From his writings and those of others who knew him–mostly letters–we learn that his parents were wealthy Christians, his father probably a doctor. Dorotheos (a male name then, meaning gift of God) had a brother who also became a monk. As a child he loved swimming and fishing. Antioch suffered an earthquake when Dorotheos was around 20 years of age; it is surmised that his parents and the family home were lost. Perhaps this is when he and his brother traveled by ship to Gaza. Dorotheos was well educated, and Gaza was reputed as a place of learning. In Gaza Dorotheos met some saintly monks of a monastery a couple miles away which had been built around a small colony of hermit huts. After ten years in Gaza, Dorotheos entered this monastery at Thawatha. It was here that Dorotheos would learn matters of the soul by living out a life of poverty, chastity and obedience…and not without much persecution. Dorotheos was placed in charge of the infirmary but became ill himself. In fact, he mentions he was not able to practice the austerities due to his own weak health. Yet he rose the ladder of spiritual perfection through losing attachment to the material world as well as learning and practicing virtues and conquering vices. Dorotheos did so with the means about him in his daily life with others…including personal suffering and trials. His spiritual journey continued within himself, over years of moment-by-moment life lessons. Yes, he had the same types of trials we have with relationships, overcoming the flesh, in prayer, and feeling lazy about striving for the good, for virtues, for God. But Dorotheos persevered. Over time, people turned to him for prayer and counsel. He would tell them in essence, “If you are willing to labor a little, be patient, and pray much, God will come to your assistance.” It was around 543, when Dorotheos was in his late thirties, that he felt called to a life of solitude while yet not distant from the heartbeats of his brethren. As to what he said–of many profitable words spoken to the benefit of others–I return to his advice and personal action when someone either wrongly or rightly accuses us of something. Dorotheos would humbly answer when accused of something he had truly done: I have done it; I am sorry; please pray for me. When someone accused him of that which he had not done, Dorotheos would say: I am sorry; please pray for me. This response is truth and humility at best. We should not admit that we have done what we have not done. Yet by careful self-examination, we may see that we have been at fault–or at least grasp the accuser’s perception. Always it is right to admit if we did do a wrong. Either way, even if the accuser is wrong, it is true to say we are sorry. It is a sad and sorry matter to be wrongly accused or for another to have an inaccurate perception or opinion. Finally, always it is good for the accused to sincerely ask: Please pray for me. Information from: Dorotheos of Gaza: Discourses and Sayings, translated by Eric P. Wheeler. 1977. Kalamazoo, MI: Cistercian Publications.